That’s right! Fantastic Beasts actor, Eddie Redmayne originally auditioned to play a young Tom Riddle in Chamber of Secrets but was turned down after reading just one line. Thankfully, he was lucky enough to play the role of lead character, Newt Scamander in the spin-off movie. Oh, and he won an Oscar for Best Actor in 2015. More of a hidden Harry Potter Easter Egg but also a very interesting fact, Harry Potter and writer, J.K Rowling have the same birthday – July 31st! That’s not all. The reknowned author has revealed that Hermione is a bit like her when she was younger. In fact, her favorite animal is an otter, which, as you know, is Hermione’s patronus. I’m sure many of you have had people pronounce your name wrong. This is true for poor Hermione as Rowling confessed that she’s received many letters asking how to pronounce her name. In fact, that whole moment in the Goblet of Fire where Hermione helps Viktor Krum pronounce it correctly, was for the fans. “Latin is a dead language, dead as can be. It killed the Romans and now it’s killing me.” If you’re a wizard, this schoolboy rhyme might ring true. Many deadly Harry Potter spells such as “Imperius”, “Crucio” and friendlier ones like “Obliviate” and Harry’s favorite, “Expelliarmus” are based on Latin terms. The language certainly isn’t dead among wizards. We all know that a boggart manifests itself as the thing you fear the most. What could it manifest for He-Who-Must-Not-Be-Named? Tom Riddle’s biggest fear is death, so his boggart would most likely represent his own lifeless corpse, according to Rowling. Talk about death anxiety. What makes the Dementors so convincingly scary? Rowling apparently based the foul creatures on her own experiences of depression following the death of her mother. “It’s so difficult to describe [depression] to someone who’s never been there, because it’s not sadness. I know sadness. Sadness is to cry and to feel. But it’s that cold absence of feeling—that really hollowed-out feeling. That’s what Dementors are”, “Rowling told Oprah Winfrey. Hogwarts’ motto, “Draco dormiens nunquam titillandus,” translates to “never tickle a sleeping dragon.” A rather peculiar statement, but good advice nonetheless. You might have thought “Draco” was an odd name for a child but it’s not the worst compared to his family name. In Old French, “malfoi” means “bad trust” or “bad faith.” They say never judge a book by its cover but what do you say about someone who has “dangerous to trust” in their own name? It’s a very accurate definition, to say the least. According to a 60 Minutes interview in 2003, Rowling came up with the idea of Quidditch after a row with her then-boyfriend. If a game involves random flying objects that only exist to hit you in the face, some violent feelings must have been involved to create it – “I don’t really know what the connection is between the row and Quidditch except that Quidditch is quite a violent game and maybe in my deepest, darkest soul I would quite like to see him hit by a bludger”, she said. Think Harry Potter and the Sorceror’s Stone was a disappointing alternative for the first book title? An early idea by Scholastic was to call it “Harry Potter and the School of Magic” but the idea was dropped by Rowling for not feeling right. Thank goodness. Alan Rickman loved to play “very interesting people.” What could be more interesting than having to teach the legendary son of your former crush and school bully? Thanks to Rowling, Alan was aware from quite early on that Snape loved Lilly Potter and it was likely key in selling his resentment over the Boy Who Lived. “I told him really early on that Snape had been in love with Lily, that’s why he hated James, that’s why he projected this amount of dislike onto Harry,” she said. As much as they love to play up their pure-bloodedness, the Malfoy family were actually famous for rubbing elbows with the courts of Muggle England until the 18th century. c“There is ample evidence to suggest that the first Lucius Malfoy was an unsuccessful aspirant to the hand of Elizabeth I, and some wizarding historians allege that the Queen’s subsequent opposition to marriage was due to a jinx placed upon her by the thwarted Malfoy,” Rowling revealed. 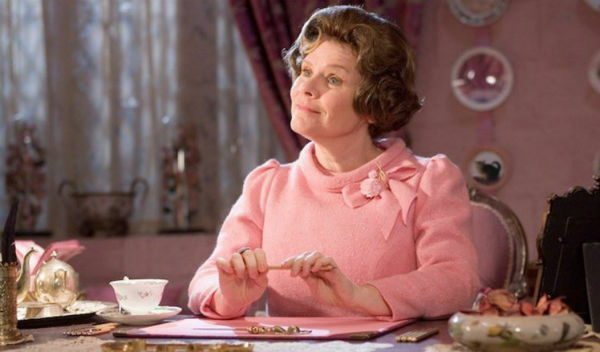 When he wrote a review for the Order of the Phoenix in his Entertainment Weekly column, Steven King praised Dolores Umbridge as “The greatest make-believe villain to come along since Hannibal Lecter.” Does that make her scarier than Lord Voldemort. I vote no. When director, Alfonso Cuarón told his three stars Rupert, Daniel and Emma to write an essay about their characters, they took it to heart as Watson wrote ten pages and Grint didn’t submit anything. He had exams then but it worked “because that’s what Ron would have done.” A+ Rupert! Hit with the beauty stick some time in his teens, Mathew Lewis had to wear a fat suit between films 3 and 6 and false teeth for 3 and 4 to play Neville. Cruelly apt for unlucky Neville, this is very embarrassing when you’re 15 and suddenly interested in girls. The stars must have aligned when twins, Fred and George were born. They were literally born to be jokers! The wizard kings of practical jokes have their shared birthday on April 1st – AKA, April Fools’ Day – the official day of practical jokes and spreading hoaxes! Cakes and boxing telescopes all round! in stone. Good thing too as Rowling had several important figures lined up to die including Arthur Weasley. He luckily escaped the kiss of death because “there were very few good fathers in the book. In fact, you could make a very good case for Arthur Weasley being the only good father in the whole series.” That’s not all. Rowling almost forced us to say goodbye to Ron, as well. She told Radcliffe that she had “seriously considered it“. Mandrake, wormwood, wolfsbane, knotgrass, belladonna and more! Surprisingly, a lot of herbology plants are real, some of which can be found in your local garden centre. As a matter of fact, Rowling didn’t completely invent the idea of the mandrake baby. The whole thing about mandrake roots having a lethal scream when you pull them out of the ground is genuine Medieval folklore. Some plants including flax weed, toadflax, fleawort, Gout-wort, grommel, knotgrass and Mugwort were names collected by Rowling out of a 17th century book by herbalist Nicholas Culpeper. Like Voldermort and his seven horcruxes, wizards are certainly good at hiding their secrets. How many of these magical facts about Harry Potter did you already know? Are there any we might have missed? Comment and let us know!